Kia Motors has confirmed that it would not launch compact cars in India soon. Also, it will launch a new model every six months starting from mid-2019. The first one will be the Kia SP Concept. Kia Motors is going to launch its first product, likely by April 2019. Hyundai Creta based Kia SP Concept will be the first one down the line. After that, Kia plans to launch many new models. However, in its upcoming cars list, it plans to exclude compact cars. As per the reports, Kia Motors will first focus on premium cars, then move to the mass-produced car segment. The brand rules out compact hatchbacks for the Indian market anytime soon. As per our expectations, Kia would be launching Rio and Picanto hatchbacks in India. While Picanto was spotted testing a few times, Rio hatchback was given to many publications as a media car. The exact list of upcoming cars has not been revealed yet. Other than SP Concept, we expect Rio sedan, Sportage, Carnival MPV, Optima and Stinger GT to launch in India. All of these cars fall in the premium segment. In the current market scenario, compact cars count up to 70% market share. Major brands in this department include Maruti Suzuki, Tata Motors and Hyundai. These brands have each of their models in every four-wheeler segment. Kia Motors is a subsidiary of Hyundai Motors. Most of the Kia models use platforms and engines of Hyundai cars. The designing and prices are a bit premium than Hyundai cars. Also Read: Kia Rio Sedan will be a very tough competitor for Maruti Ciaz and Honda City – Here is the reason why! 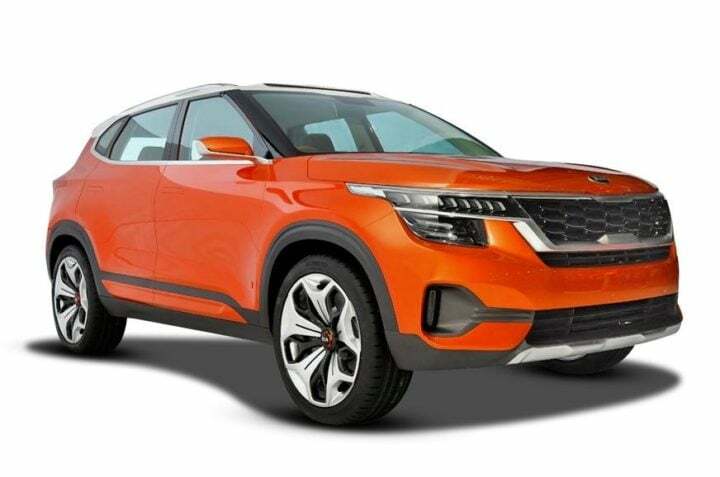 Kia SP Concept is based on Hyundai Creta, and it borrows its platforms and engines as well. Kia cars will come with BS-6 engines and the current Hyundai engines are still BS-4. So, as of now, the engine specifications and capacity are unknown too. Rio Sedan is based on Verna’s platform and if launched, will debut C-segment alongside Verna. Similarly, Sportage uses Tucson’s platform and Optima uses Elantra’s platform. Carnival MPV is also expected to debut the Indian market. It will be placed above Toyota Innova Crysta, to fit as a more premium MPV. It will most likely go against the likes of 7-seater Tata Harrier. Kia Stinger will be a premium sedan competing with the likes of BMW 3-Series, Mercedes Benz C-Class and Audi A3. As of now, Kia Motors plans to fill some segments above the compact car segment. There is no idea of the car that will launch after SP Concept.